HTTP is too heavyweight for IoT devices, and request-response isn't responsive enough. Learn MQTT instead. Refcard includes message types, QoS levels, client libraries, and security. The Internet of Things (IoT) has recently gained massive traction. IoT challenges enterprises, small companies, and developers with new problems to solve. While HTTP is the de-facto protocol for the human web, communication between machines at scale requires a paradigm shift— steering away from request/response and leading towards publish/subscribe. This is where the ultra-lightweight, massively scalable, and easy-to-implement protocol MQTT enters the picture. MQTT is a binary client-server publish/subscribe messaging transport protocol, standardized by OASIS. It is lightweight, open, simple, and easy to implement. Designed with a minimal protocol overhead, this protocol is a good choice for a variety of Machine-to-Machine (M2M) and Internet of Things applications, especially where a small code footprint is required and/or network bandwidth is at a premium. 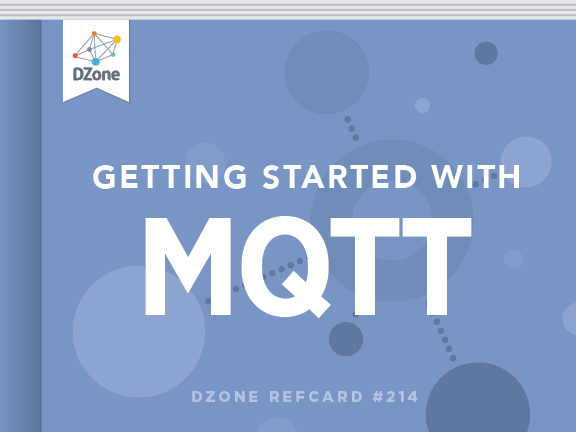 MQTT utilizes many characteristics of the TCP transport, so the minimum requirement for using MQTT is a working TCP stack, which is now available for even the smallest microcontrollers. The most recent version of MQTT is 3.1.1, which has many improvements over the first public MQTT release, MQTT 3.1. MQTT implements the brokered publish / subscribe pattern. The publish / subscribe pattern decouples a client (“publisher”), which is sending a particular message from other clients (“subscribers”), which are receiving the message. This means that the publisher and subscribers don’t know about the existence of one another. The clients do not know each other, but they know the message broker, which filters all incoming messages and distributes them to the correct subscribers. MQTT has 14 different message types. Typically, end users only need to employ the CONNECT, PUBLISH, SUBSCRIBE, and UNSUBSCRIBE message types. The other message types are used for internal mechanisms and message flows. Graceful disconnect message sent by clients before disconnecting. A topic is a UTF-8 string, which is used by the broker to filter messages for each connected client. A topic consists of one or more topic levels. Each topic level is separated by a forward slash (topic level separator). In comparison to a message queue, a topic is very lightweight. There is no need for a client to create the desired topic before publishing or subscribing to it, because a broker accepts each valid topic without any prior initialization. MQTT Topic Wildcards can be used for topic filters when subscribing to MQTT messages. These wildcards are useful if a client wants to receive messages for different topics with similar structure at once. Wildcards are not allowed in topic names when publishing messages. The wildcard characters are reserved and must not be used in the topic. These characters cannot be escaped. A wildcard that matches one complete topic level. It must occupy an entire topic level. This wildcard can be used more than once in a topic subscription. A wildcard that matches any number of levels within a topic. It must be the last character of a topic subscription. Each MQTT publish is sent with one of three Quality of Service (QoS) levels. These levels are associated with different guarantees with regards to the reliability of the message delivery. Both client and broker provide additional persistence and redelivery mechanisms to increase reliability in case of network failures, restarts of the application, and other unforseen circumstances. MQTT relies on TCP, which has reliability guarantees on its own. Historically QoS levels were needed to overcome data loss on older and unreliable TCP networks. This can still be a valid concern for mobile networks today. At most once delivery: The sender tries with best effort to send the message and relies on the reliability of TCP. No retransmission takes place. Exactly once delivery: The protocol makes sure that the message will arrive exactly once at the receiver. This increases communication overhead but is the best option when neither loss nor duplication of messages are acceptable. A Last Will and Testament (LWT) message can be specified by an MQTT client when connecting to the MQTT broker. If that client does not disconnect gracefully, the broker sends out the LWT message on behalf of the client when connection loss is detected. See the section "Pub / Sub With Paho" for an example. Each sent MQTT message can be sent as a retained message. A retained message is a last known good value and persists at the MQTT broker for the specified topic. Every time a new client subscribes to that specific topic, it will instantly receive the last retained message on that topic. This is also the case for matching wildcards. An MQTT CONNECT message contains a keepAlive value in seconds where the client can specify the maximum timeout between message exchanges. This allows the broker to detect a half-open connection and close the connection to the (already disconnected) client if the keepAlive value is exceeded by more than 150% of the value.So if a connection between broker and client is still established, the client sends a PINGREQ message to the broker within the keepAlive interval if no other message exchange occurred. The broker responds with a PINGRESP message.Every client specifies its keepAlive value when connecting and the maximum value is 65535 seconds (18h 12m 15s). A variety of high-quality MQTT brokers are available. The table below shows the most popular open source and commercial broker implementations. mosquitto is an open source MQTT broker written in C. It fully supports MQTT 3.1 and MQTT 3.1.1 and is very lightweight. Due to its small size, this broker can be used on constrained devices. HiveMQ is a scalable, high-performance MQTT broker suitable for mission critical deployments. It fully supports MQTT 3.1 and MQTT 3.1.1 and has features like websockets, clustering, and an open-source plugin system for Java developers. ActiveMQ is an open-source multi-protocol message broker with a core written around JMS. It supports MQTT and maps MQTT semantics over JMS. RabbitMQ is a scalable, open-source message queue implementation, written in Erlang. It is an AMQP message broker but has an MQTT plugin available. Does not support all MQTT features (e.g. QoS 2). mosca is an open-source MQTT broker written in Node.js. It can operate as standalone or be embedded into any Node.js application. Does not implement all MQTT features (e.g. QoS 2). RSMB is a message broker by IBM available for personal use. It is written in C and is one of the oldest MQTT broker implementations available. Websphere MQ is a commercial message- oriented middleware by IBM. Fully supports MQTT. A variety of MQTT client implementations are available for most of the popular operating systems and programming languages. These lists give an overview of the most popular MQTT client libraries and MQTT client tools. Paho clients are among the most popular client library implementations. M2MQTT is an MQTT client library for .NET and WinRT. The Fusesource MQTT client is a Java MQTT client with 3 different API styles: Blocking, Future-based, and Callback-based. Machine Head is an MQTT client for Clojure. It implements the basic MQTT 3.1 features. MQTT.js is an MQTT client library for Node.js and web applications, available as a npm module. ruby-mqtt is an MQTT client available as a Ruby gem. It does not support QoS > 0. MQTT.fx is a JavaFX application with a clean interface and advanced features like scripting, broker statistics, and templates. mqtt-spy is a JavaFX application that is easy to use and focused on analyzing MQTT subscriptions. There is also a CLI-based daemon application available, which does not need a graphic interface. MQTT Inspector is an iOS app that allows detailed analysis of MQTT traffic. Use of the publish / subscribe message types, and complex filterings of received messages, are available. runs on any modern browser and connects to MQTT brokers via websockets. Very useful if it’s not possible to install a client application on the machine in use, as well as for quick MQTT tests. MQTTLens is a Chrome Webapp that can connect to MQTT brokers via TCP and over websockets. This app is easy to grasp and equipped with all the basic MQTT features needed for quick tests. GUI. It is also great for MQTT task automation. Trying MQTT on the command line is very easy. Install either mosquitto or HiveMQ as the MQTT broker and start it. Download HiveMQ at http://www.hivemq.com/download and download the mosquitto client tools with the package manager of choice or via http://www.mosquitto.org. Open two terminal windows, one for publishing and one for subscribing. Now you should receive the message the publisher sent with the subscribing client. Eclipse Paho is an umbrella project which provides scalable open-source MQTT client implementations for various languages. The following examples use the Eclipse Paho Java library for the MQTT client. compile( [group: ‘org.eclipse.paho’, name: ‘org. Publishing messages is straightforward. After connecting, publishing is a one-liner with the publish() method. In order to subscribe to topics, an MqttCallback must be implemented. This callback is triggered every time an event (like messageArrived) occurs. This callback must be implemented before connecting to the broker. //Called when connection is lost. For more sophisticated MQTT applications, there are additional options for establishing a connection to the broker available. Quality of Service semantics: With QoS 1 and 2, there’s an assurance that a message arrives on the client or broker at least once/exactly once, even if the Internet connection dropped in the meantime. Queuing: When using QoS 1 or 2 and a persistent session, the broker will queue all messages a client misses from its subscriptions when it is not connected. On reconnect, all messages are delivered instantly to that client. Retained messages: Messages that are retained on the server are delivered instantly when a web application subscribes to one of these topics. Last Will and Testament: If a client doesn’t disconnect gracefully, it’s possible to publish a message to a topic in order to notify all subscribers that the client went offline. After a connection is established, the client object can be used to publish messages. In order to process messages, a callback is needed for handling each arriving message. After assigning the callback, subscribing to concrete topics is possible. Some brokers implement an unofficial bridging protocol which makes it possible to chain brokers together. Bridging allows forwarding messages on specific topics to other MQTT brokers. Bridge connections between brokers can be uni- or bidirectional. Technically, a bridge connection to another broker is a connection where the broker behaves like an MQTT client and subscribes to specific topics. Many enterprise MQTT brokers implement clustering, which supports high availability configurations and also allows for scaling out by adding more broker nodes. When a cluster node is no longer available, other cluster nodes can take over so that no data or messages are lost. Often brokers implement elastic clustering, and nodes can be added or removed any time. If broker implementation allows, clustering and bridging can be used together, enabling messages from one broker cluster to be forwarded to another isolated cluster. Security is a very important part of any communication. MQTT itself keeps everything as simple as possible and relies on other proven technologies for safeguards instead of reinventing the wheel. An MQTT CONNECT message can contain a username and password. The broker can authenticate and authorize with this information if such a mechanism is implemented. Many open-source brokers rely on Access Control Lists while other enterprise brokers allow coupling with user databases and/or LDAP systems. A best practice when using MQTT is to add transport layer security if possible. With TLS, the complete communication between client and broker is encrypted, and no attacker can read any message exchanged. If feasible, X509 client certificate authentication adds an additional layer of security to the clients: trust. Some MQTT brokers, like HiveMQ, allow the use of X509 certificates in the plugin system for further processing (e.g. authorization). Payload encryption: This is application-specific. Clients can encrypt the payload of their PUBLISH messages. The shared secret has to be provisioned to all communication participants beforehand. Payload signing: If the MQTT broker of choice supports intercepting MQTT messages (e.g. with a plugin system), every received message payload can be intercepted and signed with a private key before distributing. The distributed messages can then be verified by the MQTT clients to make sure no one has modified the message. Complex authentication protocols: For many enterprise MQTT brokers, additional authentication methods can be implemented (e.g. OAuth 2, Kerberos, OpenID Connect, etc.). Authorization / Topic Permissions: Securing access to topics is often done with a permission concept. Some brokers offer restricting publish / subscribe permissions with a plugin system. This makes sure no one can subscribe to more information than needed, and that only specific clients can publish on specific topics. MQTT 3.1.1 is the most recent MQTT release and was published in October 2014. While most popular MQTT brokers and MQTT client libraries support MQTT 3.1.1, some older implementations still use 3.1. While mainly backwards- compatible, the two versions have subtle differences. Session present flag: If a client connects with a persistent session (which means it doesn’t use a clean session), an additional flag was introduced in the CONNACK message to indicate that the broker already has prior session information of the client like subscriptions and queued messages. Error codes on failed subscriptions: Prior to MQTT 3.1.1, it was impossible for clients to find out if the MQTT broker didn’t approve a subscription, which could be the case when using fine-grained permissions for MQTT topics. The new spec changes that and adds a new error (0x80) in the MQTT SUBACK message, so clients can react on forbidden subscriptions. Anonymous MQTT clients: The MQTT client identifier can be set to zero byte length. The MQTT broker will assign a random client identifier to the client temporarily. Immediate publishes: MQTT clients now have the ability to send MQTT PUBLISH messages before waiting for a CONNACK response of the MQTT broker. No client identifier restrictions: MQTT 3.1 had a limit of 23 bytes per client identifier. With the removal of this artificial restriction, client IDs can now use up to 65535 bytes. A Last Will and Testament (LWT) message can be specified by an MQTT client when connecting to the MQTT broker. If that client does not disconnect gracefully, the broker sends out the LWT message on behalf of the client when connection loss is detected. See the section \"Pub / Sub With Paho\" for an example.